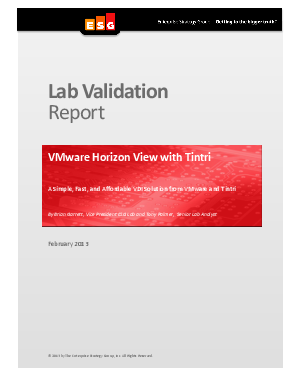 This validation report from leading independent analyst company, ESG, documents the results of their hands-on testing of VMware Horizon View with the Tintrí VMstore platform. Testing focused on performance in the context of the end-user experience in a 1,000 seat virtual desktop environment. In addition, the ease of deployment, manageability, and cost-effectiveness of the Tintrí solution in VMware environments were also examined.